No. 2807 worked the demonstration freights again on days 3 and 4 of the gala. 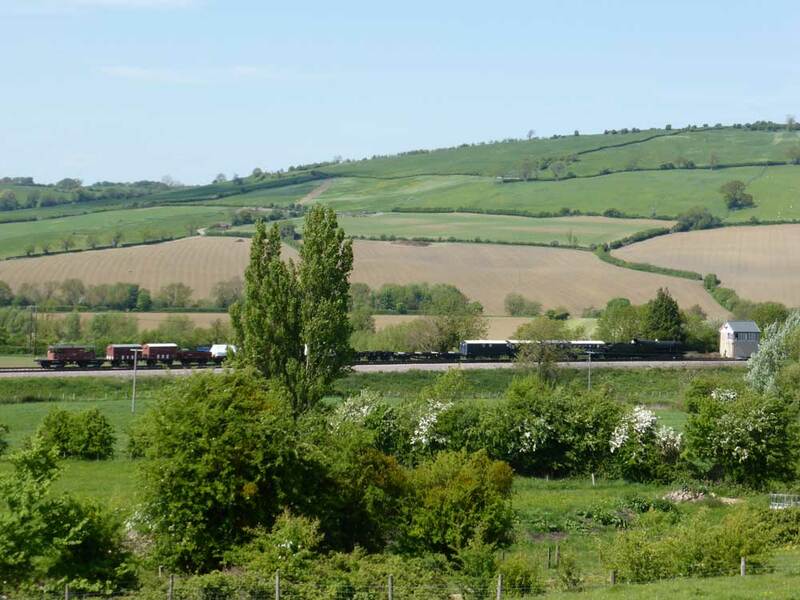 The first photo shows 2807 waiting near to Gotherington signalbox nestled in a beautiful Cotswold valley. Day 3 of the gala, 26th May. 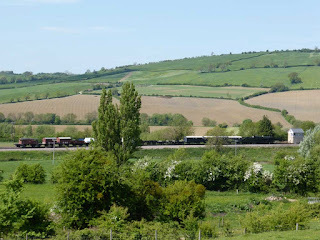 And this one shows 2807 leaving Toddington on day 4, 27th May. The standard tank had failed with a steam brake problem, and 2807 stepped in to take the tank's duties, which included this freight to Cheltenham. Today saw the first day of the GWSR's first major steam gala since 2010. 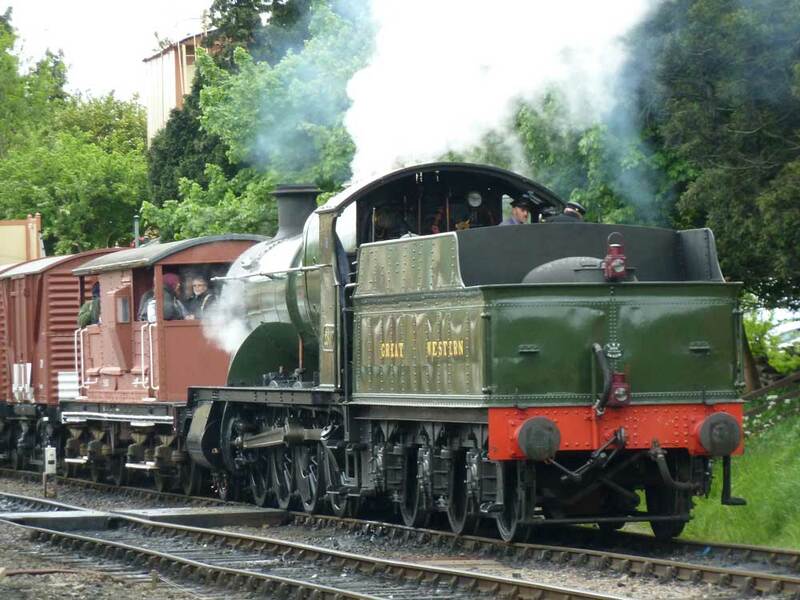 The Cotswold Steam Celebration is a four day event spanning the bank holiday weekend. 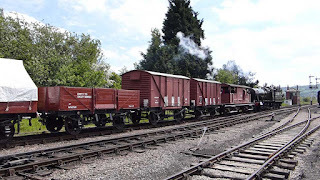 She effortlessly hauled the train of 14 wagons and two brake vans as though it was nothing. A video will appear on YouTube shortly. 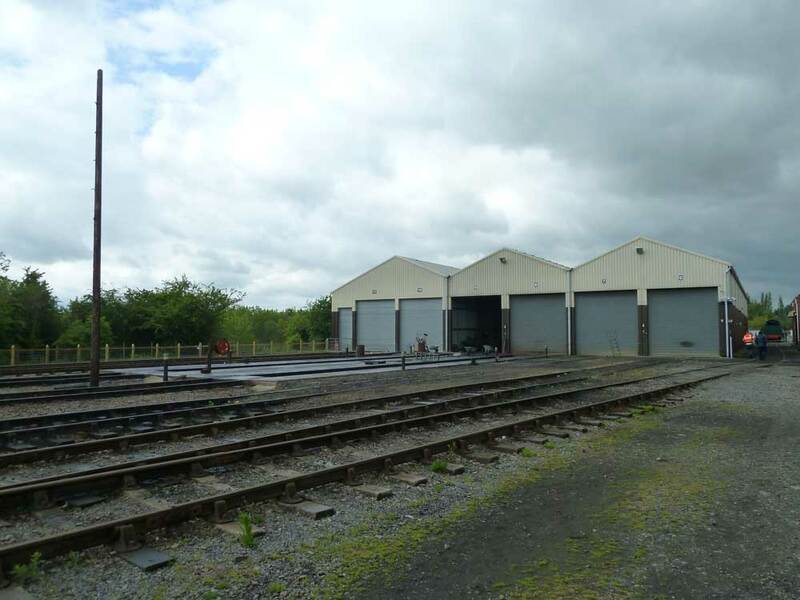 Meanwhile, Toddington yard looked rather spooky. 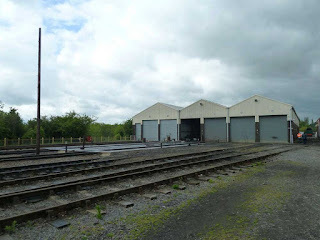 The yard is hardly ever empty like this, but all of the steam locos were in use (even the spare engine) and diesels were in the sheds creating this unusual scene. Later in the day 2807 posed on the parlour road behind her notice board. Three more days to go and plenty of opportunities to see 2807 and the other locos in action. Geof and I spent the entire day crawling beneath the tender. We removed all of the brake blocks and took measurements to calculate where to drill the pivot holes in the new brake blocks. 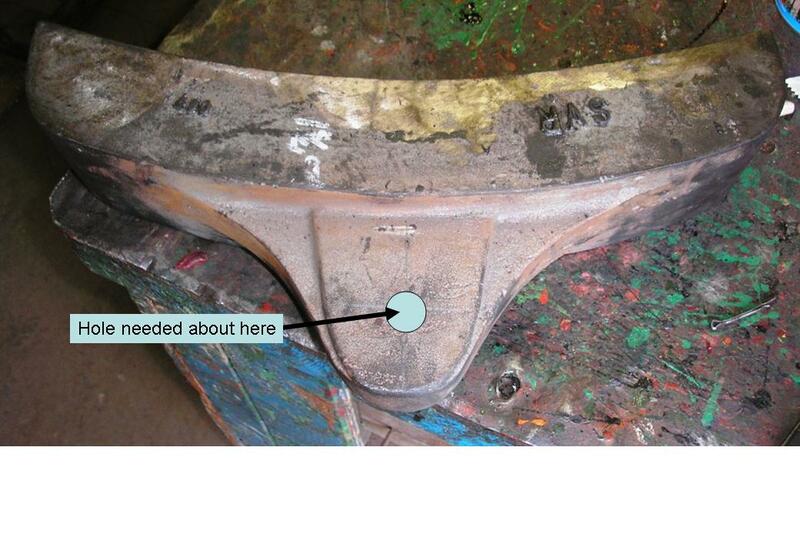 Photo attached shows the left-hand rear worn block next to a pristine new one. We also measure the space between the sides of each brake hanger, and discovered that the new brake blocks for the centre axle will need a bit shaving off them! Needless to say, the hangers on each axle are different. Anyway, we put the old brake blocks back in (because there was no chance of drilling out the holes on the new ones on Monday). I popped down to re-stock the F&W, as they had sold 5 boot scrapers over the weekend. While there, I saw that the recently-arrived "Cheltenham" was "unserviceable". A chap was doing some welding on a copper pipe - that is to say, he had completely blocked the way into our TPO with two gas bottles and a 12 foot copper pipe. I think this is all part of P^O's panic to be ready to view next weekend! As I left, I decided to pop into the Mess Coach. There was a Red Card against our engine! Apparently the LHS-centre spring on the tender is broken. Neither Geof nor I noticed it on Monday (and as it happens, I did walk down the LHS checking the springs on Monday). We've got a spare, fortunately. By chance, I had a phone call from "Ray" who wanted a GWR boot scraper. I nipped over to Todders; sold him the b/s; and took a gander at the spring. Sure enough - a hairline fracture, 1/4" long, 3rd leaf down. Gil & Bruce prepared the loco - it had to be moved to allow Cheltenham onto the pit. They then jacked up the tender; removed the old spring; and had a cup of tea. I arrived just in time with the milk! We then fitted the new spring and tidied up. By now it was lunchtime. Bruce went home to feed Daphne, who's recovering from her op. 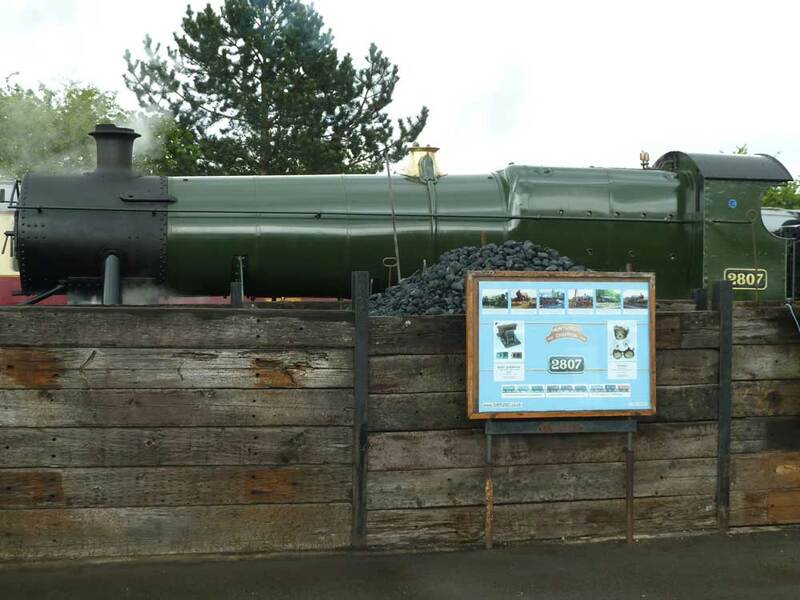 Fred & Dixie were working on the siphon restoration work at Winchcombe, and called in to join us for lunch. After lunch, I did a bit of boot scrapering, while Gil did a bit of measuring (of the pins that secure the brake blocks). We will have new pins made for the new blocks. A quick bit of painting in order to have a good stock of <you know whats> for next weekend! 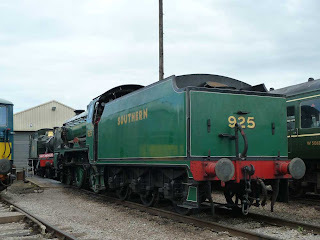 Only Gilbert & myself, as 2807 was in service, along with the SR Schools Class "Cheltenham". Gil painted some rail off-cuts (which he sells on the stall) and the spark arrester in case we need to fit it. I finished off more boot scrapers ready for the gala, next weekend. I noted that the F&W had sold two, and the Coffee Pot had also sold two. Sylvia Black popped in with some videos and a teddy bear for our stall. Yes, Schools class Cheltenham has arrived at Toddington in plenty of time for the gala over the weekend of 24th to 27th May. 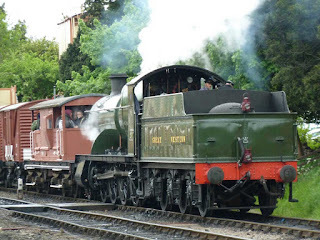 Cheltenham is seen here 'on shed' at Toddington. 2807 was in service, so the team could do little. In fact, Gilbert (and probably Fred) were working on the siphon van at Winchcombe. I painted 4 boot scrapers and re-stocked the shops (the Coffee Pot had sold 4 at Winchcombe, and the F&W had sold two at Todders). Bruce popped in to make sure we could survive without him - his wife, Daphne, had had an op. and so Bruce was chief cook & bottle-washer at home. Our very best wishes go to Daphne for a speedy recovery. These two show the rear view of two of the hangers on our tender. Spot the differences. Meanwhile, Steve, John and I were preparing rail chairs. John fitted out the new needle-gun with a chisel attachment, and he then attacked the filthiest of chairs - caked in mud or covered in grease. The new gadget seemed to clean these admirably! There are 8 now in a fit state to be needle-gunned. Oh, and the spring part of the chisel attachment broke! Brand new - first time used ... luckily we had a second one! 2807 is in service tomorrow (Sunday). 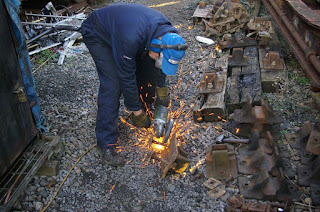 On Monday, Geof & I are going to attempt to remove and measure the brakes on the tender. On Wednesday the team will complete whatever Geof & I didn't. Over the gala weekend (24th to 27th). I hear that there is a 17-wagon freight that will be running. It was lovely to see 2807 face to face with 4270 today. Can't wait to see these two in steam together. Won't be long now! The "shall we stay or shall we go" saga over the Great Central (Ruddington) was a bit of a farce. As far as I can make out, the 9F failed so GC asked both (at the same time) Wadebridge and 2807. They went for Wadebridge. Then GC had a derailment, which left them a loco short (again), so they asked for 2807 (again). However, the cost of transport (about £5k) when they'd just had to fork out similar for Wadebridge, was too much. As a result, they backed out and GC (Loughboro') provided a substitute. Gil & Fred worked on the siphon restoration. Geof decided to investigate a possible cause of our horn guides wearing out rather sooner than expected. With assistance from Mike (whose surname I don't remember) they removed the lubrication pipes from pots to each axle and blew through. All pipes appear to be free-flowing. However, the RHS trailing axle did seem to leak oil out of the delivery. John (soldier that he is) got stuck in to cleaning rail chairs (again) and prepared 8 by close of play. I spent most of the day painting chairs. We'd have a prob with our (one working) needle gun. It kept running out of breath! So, Gil had bought a new one - which John was using. I decided to strip down the old one to see if the cause was evident. With an array of pieces on the bench, I cleaned and assembled the puffy bit, and borrowed John's air line ... I seemed to have made matters worse! Back to the bench (in lieu of drawing board), I worked out the mechanism, and saw that a rubber bung (essentially the on/off tap attached to the trigger) had a bit of a hole in it. So, I bunged up the hole with a 1/16th inch length of screw thread, and - Hey Presto! - it works again! 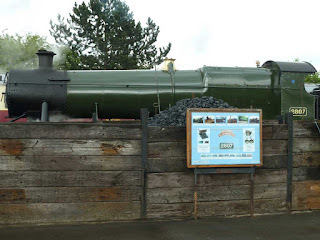 There's 14 minutes of GWSR footage at the beginning of the program. Ideal for those of you who live too far away to keep popping down for your fix! 7 of us were shovelling concrete at Toddington this morning - extending the coal bunker and flooring a new ash bunker. David welded up some corner pieces for Fred in his restoration of the siphon van. Gil was doing something between the frames ... not sure what. Then he cleaned the spark arrester. All it needs now is a couple of coats of heat-resistant paint. Steve arrived and did some tidying up of FLA sales items. I finished off a couple of boot scrapers (John T. - yours are ready, on the bench). After lunch there was a Board Meeting (yawn!). 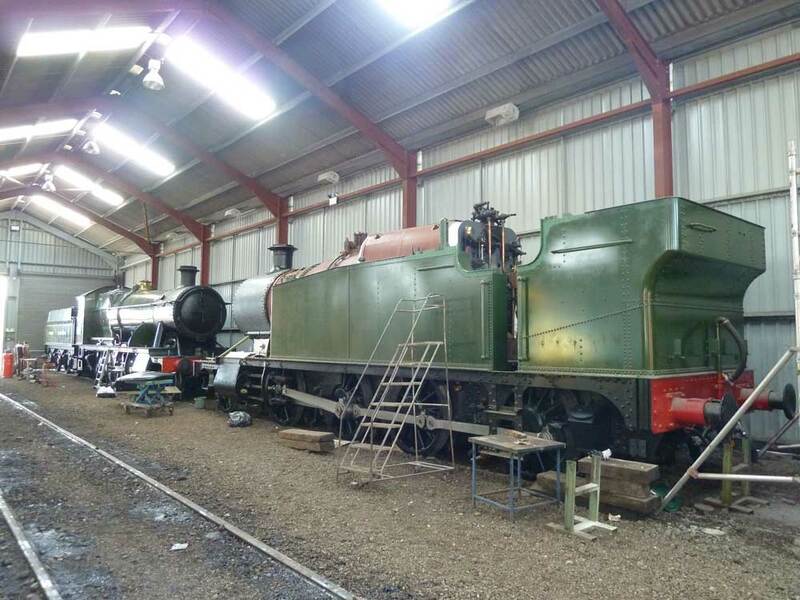 It has been decided to change the safety valve springs at the next washout, after the gala at the end of May. 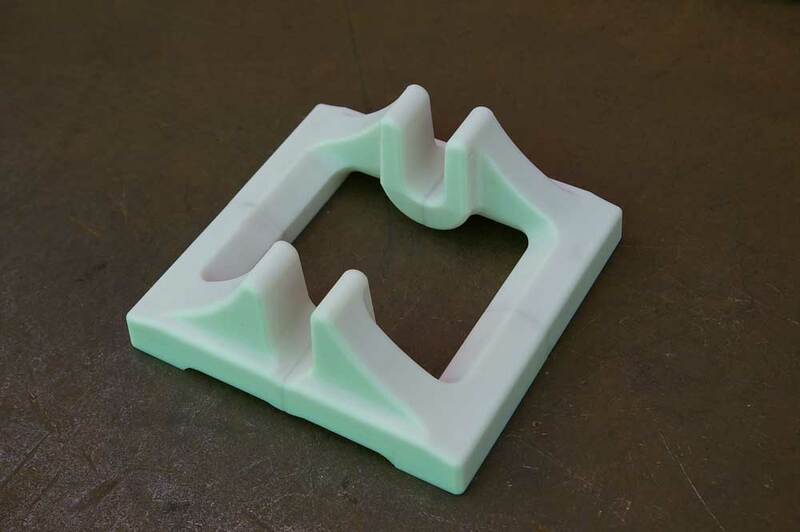 Ingo has 3-D printed some components of the new regulator slide valve. He's doing this in spare time, and we will have the valve cast when all of the components are completed. 2807 is next in service on Friday for a Fire & Drive (it is Tony's favourite loco for doing F&D!). Then she's in use on the Saturday and Sunday.